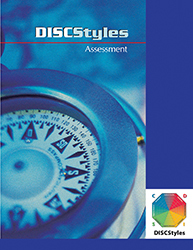 This easily administered 30-item DISC assessment includes use of three interpersonal settings to maximize contextual authenticity (work, home, social). Each of the three standard interpretive graphs are plotted enabling a complete view of your preferred style, and since the DISCStyles assessment can be completed in only 10­–15 minutes you gain valuable time for individual coaching sessions or group discussions. and enhance relationships. Once you know your own personality and behavioral style characteristics, it will be easy to see what drives those around you and your options for dealing with them more successfully.